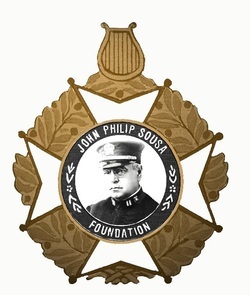 Welcome to the webpage of the John Philip Sousa National Honors Band - New England Region! This is an Honors Band Program sponsored by the John Philip Sousa Foundation designed to promote wind band music for junior and senior high school band students, primarily in the six state New England region of Maine, New Hampshire, Vermont, Massachusetts, Rhode Island, and Connecticut! Festivals have been held in 2002, 2004, 2006, 2009, 2012 with the most current one being held in 2014. Current news about this festival along with necessary forms and brochures are included on this website. Please check back often for updates and newsflashes. AS OF MAY 5, 2014 - To all participants in the 2014 John Philip Sousa National Honors Band - New England Region: "Congratulations" for a job well done at the 2014 Sousa Band Festival held recently in Gorham, Maine. It is our hope that you had a great time making music and made some new friends from all over New England in the process. It was a joy to work with so many polite and appreciative students in this festival. You are all so much a credit to yourselves, your parents, and your families. Whenever there were challenges, you stepped up to the plate and handled them graciously. Those of you staying in the hotel were very polite and cooperative as well. Overall, we would say that your parents/guardians have every right to be so proud of you! The music teachers and chaperones who you saw all weekend working as stage crew members, running sectionals and masterclasses, and checking up on you at night were devoted to the cause of making this a wonderful experience for you. You are lucky to have such wonderful people to work with in your schools...please be sure to say a special thank you to them! An extra special thanks is extended to Mrs. Kim Mathieu and "Team Gorham" for doing such a magnificent job as hosts! Whatever directions life's journeys take us, it is our hope that you will remember this festival fondly for the rest of your lives and that hopefully, our paths will cross again some day. For more information, e-mail us at sousanewenglandinfo@gmail.com.